The last few days we have been blessed to see two incredible Balinese temples. 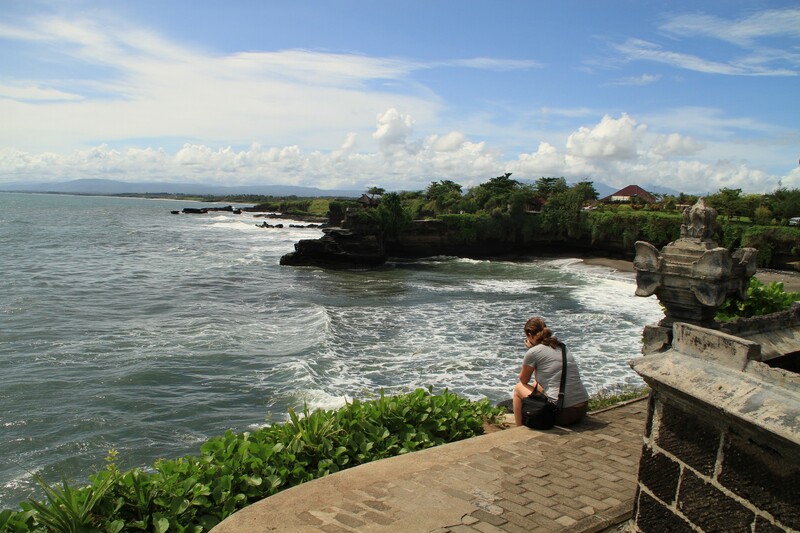 The first, Tanah Lot, is located on the southwestern coast in Bali. Tanah Lot is claimed to be the work of the 15th century priest Nirartha and has been a part of Balinese mythology for centuries. 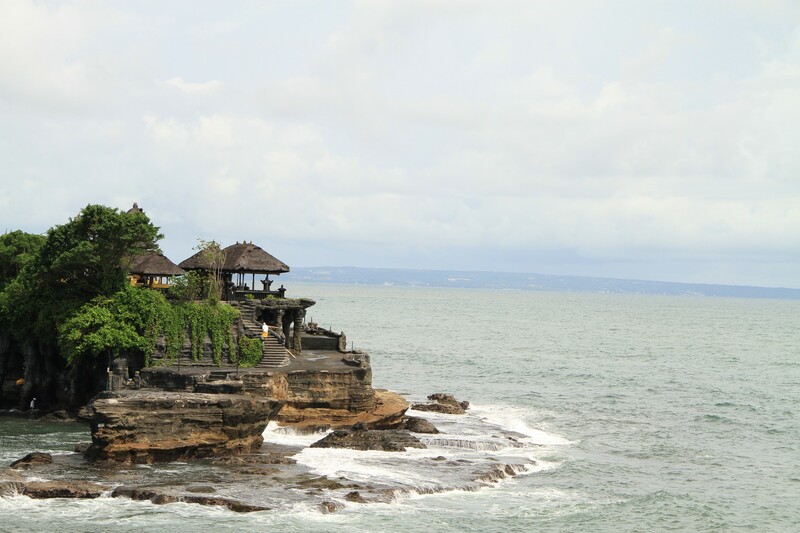 The temple is one of seven sea temples around the Balinese coast. Each of the sea temples were built so they were within eyesight of the next to form a chain along the south-western coast. 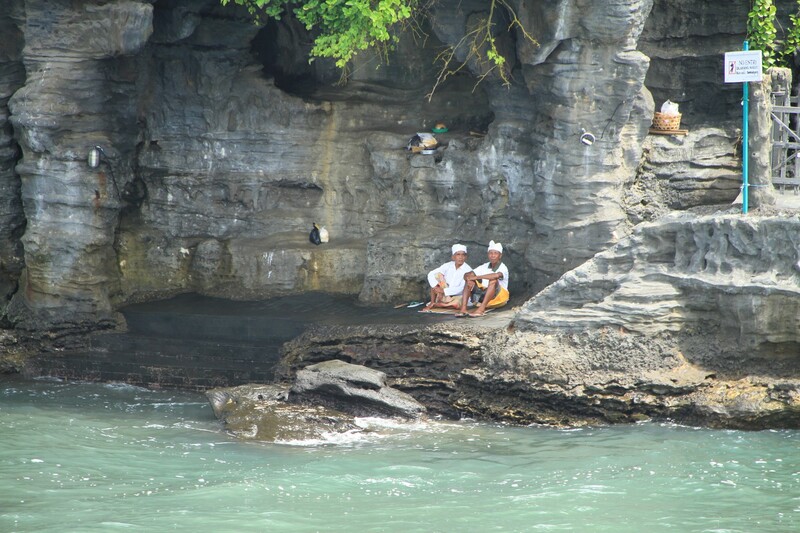 Tanah Lot is one of Bali’s most sacred sea temples and is dedicated to the guardian spirits of the sea. The temple itself is said to be guarded from evil by the sea snakes that inhabit the caves below. While we did not see any sea snakes apparently you can touch them with a guide present. As you will see from the pictures there are two caretakers of the temple who one can assume, wait for low tide to travel back and forth to the temple. And apparently Bali is a small island because we ran into a Brazilian couple that we had met in Ubud only a couple of days prior. Amando made them laugh with his reasons he wants to go to Brasil…and why Erika can’t go with him. The second temple, Pura Luhu Uluwatu is one of Bali’s nine key directional temples. 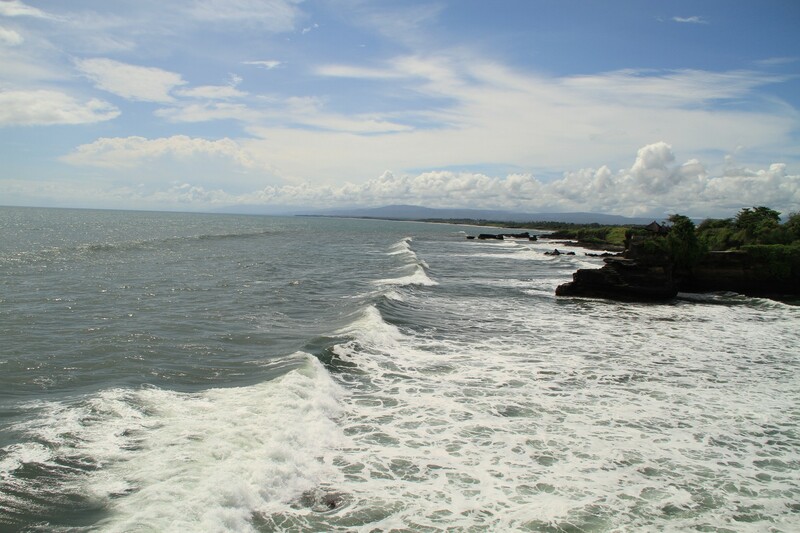 Its location on the south westernmost point of the entire island guards the Balinese from evil spirits of the ocean. Though a small temple was claimed to have existed beforehand, the structure was significantly expanded by a Javanese sage, Empu Kuturan in the 11th Century. Another sage from East Java, Dang Hyang Nirartha is credited for constructing the padmasana shrines and is claimed to have attained Moksha here. The temple itself is located on cliffs that are 70 meters above the water and watching the giant swells and Indian Ocean waves crash against the cliffs is enough to mesmerize anyone. And we were lucky enough to be there for sunset. 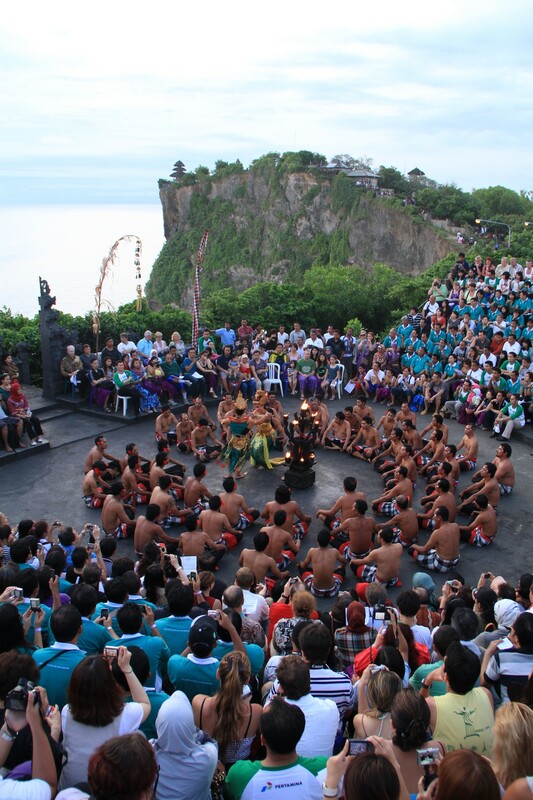 We had come to Uluwatu to see the Kecak & Fire Dance. 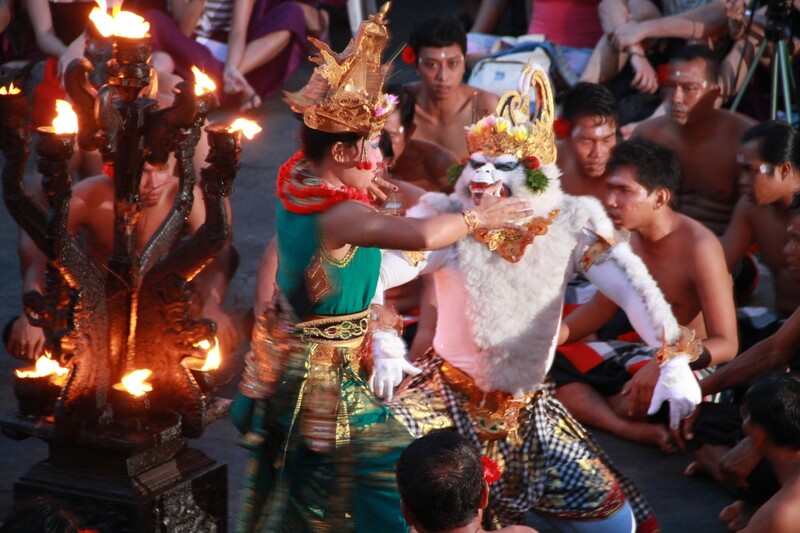 It is one of Bali’s most unique dances because, unlike all other Balinese performances it is not accompanied by musical instruments. Rather a chorus of seventy men imitate the sounds of musical instruments, tell the story, and provide the sound effects. 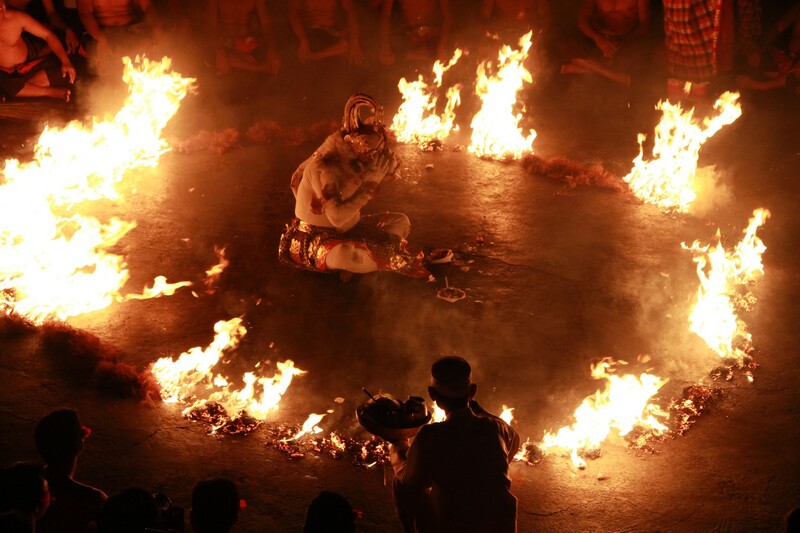 The name Kecak comes from the chattering of the cak-cak sounds of the chorus. The dance and chorus perform parts of the Hindu epic, Ramayana. 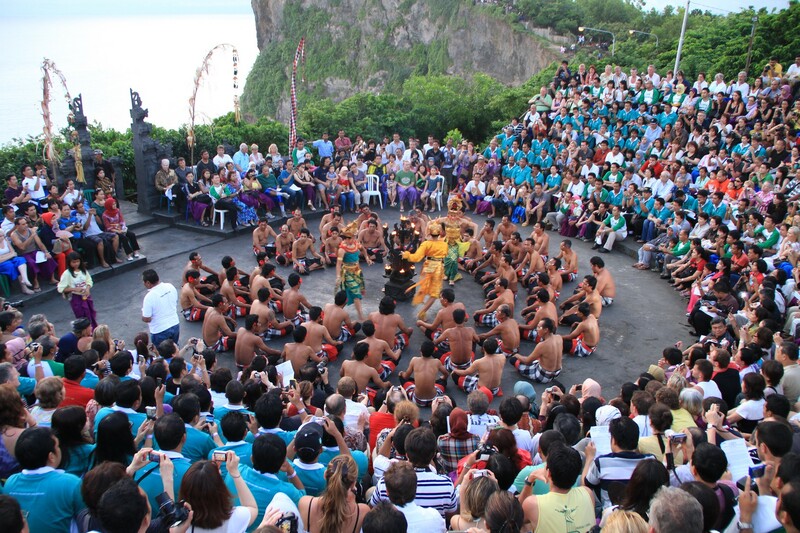 ** Traveler Tip: If you go to Uluwatu beware of the monkeys. They aren’t fed by volunteers as in Ubud, so they’re a bit hungrier and more aggressive. We watched one wrestle a sandal away from another tourist and start eating the leather.They will also bite humans if you have plastic bags. Also, from Legian we paid 300,000 Rp for a guide for unlimited time and stopping for the roundtrip. Don’t pay more than that. Entrance to the temple is 15,000 Rp/person and the show was 80,000 Rp/person and well worth it. If you’d like a great guide, Dekrit was ours and he had a great clean car with AC, spoke English VERY well, and was very fun and knowledgeable. 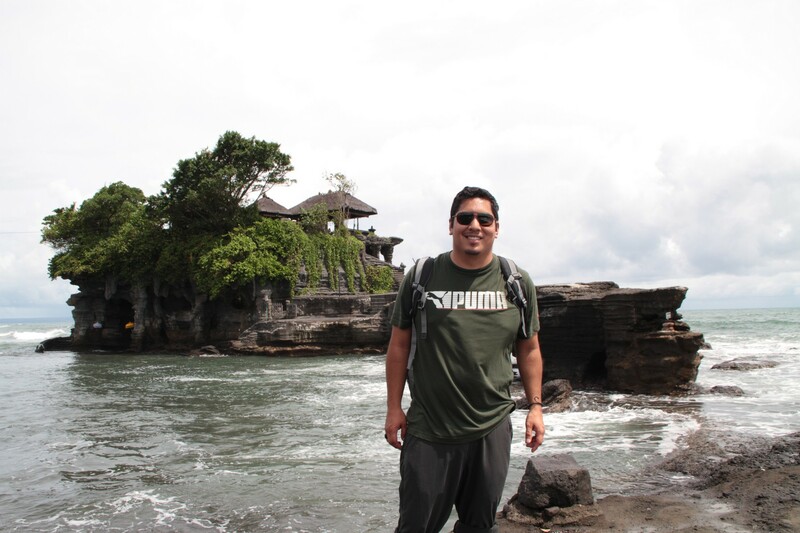 He is located in Kuta and can be hired for day trips, 3 day trips, or airport rides. Contact: Hp. 081337295848 or de_kritmacho@yahoo.com. Tell him Erika and Amando from San Francisco sent you. 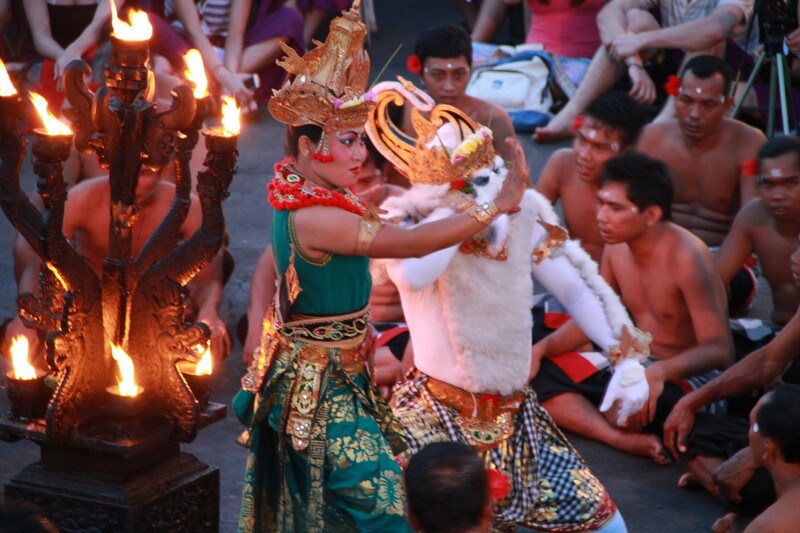 This entry was posted in Indonesia and tagged Amando, Bali, dance, Dekrit, Erika, Fire Dance, Guide around Kuta/Seminyak/Legian, Kecak, Monkey, performance, Pura Tanah Lot, Rama, Ramayana, Sita, Tanah Lot, taxi, temple, travel tip, traveler tip for indonesia, Ubud, Uluwatu, volcanic coastline by Amerika. Bookmark the permalink. Thanks for these wonderful updates, Erika and Amando! More than ever, you inspire my sweetheart wife and me to get ourselves to Bali. Thanks Mark!! Bali is beautiful and is certainly a critter lovers paradise. MUCH LOVE! !